Start your Plant cuttings quickly using water and peroxide. The peroxide creates an oxygenated water base to get the cuttings going easier than using just water alone. 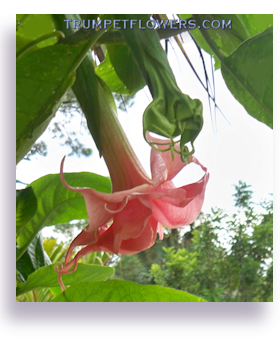 Angel Trumpet cuttings in water with added peroxide are very easy to get going. This method is very simple and straightforward. 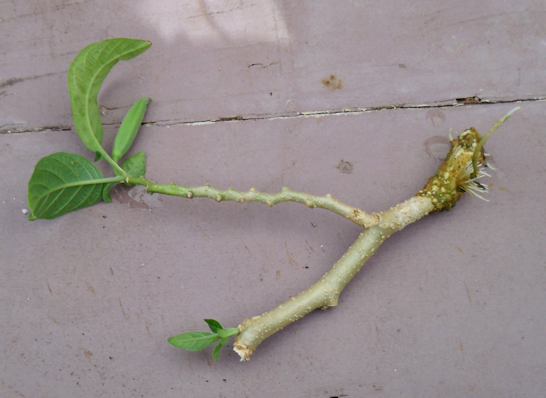 First, you will need to take proper stem cuttings if you don&apos;t already know how to do this. After you have the stem cuttings together and ready to go, get an apppropriate sized container, say a milk jug that has been cleaned and has the top portion cut off. Fill the milk jug about one∼quarter full of clean water, without any chemicals. If you want to use tapwater, let it sit overnight before using it. 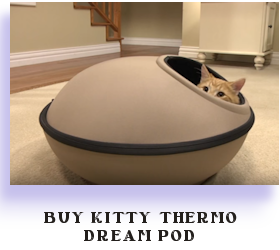 This will allow the ammonia, chlorine, and some other gases that might be in it to escape before you use it. Then add about one half capful of peroxide to the water. Add a pinch of tomato fertilizer to the water. Swirl with a spoon. If you want to stabilize smaller cuttings, you can add some perlite, vermiculite, or sphagnum moss to the water at this time. Make sure it is only enough to stay under the water line, and is loose, but dense enough to help hold up the cuttings. Add the cuttings, and place the whole thing in a semi∼shady spot. Check daily to make sure the water level continues to cover the base of the cuttings. Do not add any more peroxide. 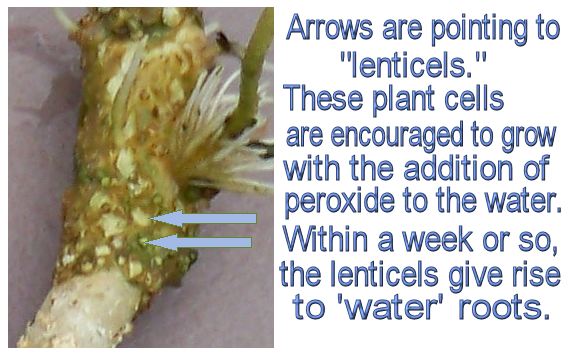 In about a week or so, you will notice lenticels beginning to form. These will become the buddings of roots in about another week or so. After about 3 weeks, you should have some nice roots to admire. Now each cutting can be transferred to pots with seedling soil mixture in it. One more thing to mention here, is that plant roots that have been borne in water, tend to need to harden off into a soil mixture. This means you will need to keep the roots in the seedling soil mixture damp for about a week, until they adapt to being placed in soil. After this period of time, you can begin to taper off on the watering, and treat them like normal cuttings. Continue to fertilize them at a normal rate, to encourage strong root systems and top growth. When the roots begin to peek out the bottom of the pots you&apos;ve placed them in, time to transfer to a larger container. This entry was posted on November 19th, 2012 and is filed under Propagation.